It’s one of the better pieces I’ve read on the challenges facing the Golden State. The key problem is that there’s no room for an economy that will support anybody but the rich and their servants in the grand plan that has dominated California politics for decades. That grand plan doesn’t resemble anything we would think of as America. For any plan to “work”, as Mr. Kotkin puts it, it must include the jobs that will pay ordinary people what used to be thought of as an ordinary income, enough for them to live in what used to be thought of as an ordinary way. The reality is that two-thirds of the people won’t be doctors, lawyers, financiers, engineers, architects, college professors, or any other job in what’s thought of as the “professional class”. When job growth is limited to hospitality, retail sales, and the lower echelons of the healthcare sector and we don’t limit the number of people who can compete for those jobs, simple supply and demand tells us there is no way those jobs will pay enough to support a middle class lifestyle. We are a large, diverse country and we need a commensurately large, diverse economy. We need more than hospitality, retail sales, education, and healthcare. We need farming, mining, manufacturing, lumber, energy production, and the thousands of other “brown” jobs that are jobs that ordinary people can do. As Jared Bernstein pointed out recently (and as I’ve pointed out for years) that means ending the currency games that enables other countries to buy Treasury bonds with the dollars they receive in trade rather than buying goods made in the U. S. A. Sadly, the trends Mr. Kotkin points to are not limited to one state. We have seen the future and it is California. Just another of those many problems that could be resolved by putting an end to all the breeding, or at least all the various subsidies for breeding. To those who say California needs workers, I say that there are thousands streaming across the border monthly from the south, all potty trained and ready and willing to work. So you’re in favor of breeding, then, you just want it done elsewhere, and then you want to import THOSE folks to work at what amounts to slave wages. Jimbino, it’s good to know that you are on the side of the feudalists. Schuler, I’m wondering at what point you’ll consider that this idea of turning America into something that resembles Mexico has been the plan of the elites all along, or at the very least a significant portion of them. I continue to believe that they see that as an unintended and unanticipated secondary effect of the benign and enlightened policies they’ve advocated and the actions they’ve taken over the period of the last half century. That they did not anticipate them when they were foreseeable and, indeed, foreseen is due to ideological blinders rather than intentional malice. And now that the results are obvious and they CONTINUE to advocate for the same policies? A lot of Californians are fleeing to my home state of Colorado. The traffic, housing prices (still “cheap” comparatively) and overcrowding are bad enough, but California policies are following. 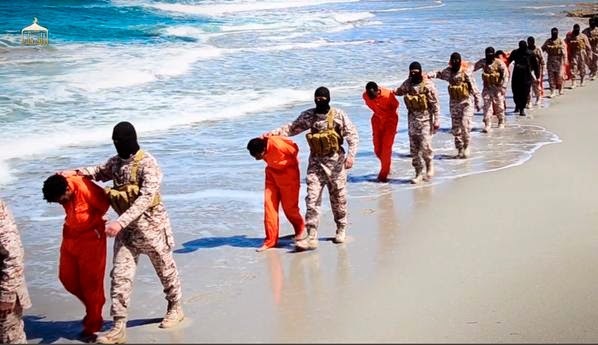 OT: So a couple of ISIS affiliated groups in Libya have released video of their members executing Ethiopian Christians en masse. Below is a link to a non-graphic image from one of the videos. I’m wondering if anyone else will notice the things that stuck out to me. Well, Andy, whaddaya expect? Those policies worked so well the first time…. What stood out to you, Ellipsis? I’m curious. Look at the condition and uniformity of the uniforms. The ISIS affiliates are wearing gear that appears to be in very good shape, and is pretty much identical from soldier to soldier. (One exception in the pic is someone wearing the all black ninja-type get up seen in many other recent videos from the ME.) The prisoners are all wearing orange jumpers that also appear to be in very good shape. The civil war has been going on for four years in Libya. This is a fringe/splinter group. How is it they’re so well equipped? Where’s the money coming from to support this? Where are the supply chains? It’s possible this is all confiscated stuff from the days of Qaddafi’s regime, but the (apparent) condition of the equipment makes me question that. This stuff looks pretty new, not like stuff that’s been in the field for an extended period. Maybe they wear their good uniforms for the beheadings? Anyhow, I’d love to here an explanation for all this, including identification of the equipment. It’s from somewhere, and ought to be recognizable to someone. The Ethiopians are wearing the same suits that Ellipses’ classmates wore at their 10th High School reunion. Sorry, that was in bad taste, but the condemned uniforms stood out to me in terms of implied institutionalism. While I weighed deleting my comment, Ellipses responded. The traffic, housing prices (still “cheap” comparatively) and overcrowding are bad enough, but California policies are following. Sorry about that, Andy. I never have understood people leaving one state, moving to a more benign one and bringing all their ideology baggage with them that made their prior location so untenable to live in the first place. Nah, I didn’t think you would be offended, and it certainly wasn’t my purpose. I’m offended at making any light of the fate of innocent people being marched off to die for some systemic insanity. I sort of get that giving your men uniforms increases their espirit de corps. There is a function there. Outfitting people for death is revolting in a way that simply shooting someone who refuses to say that there is only one god, who is Allah, and his messenger is Muhammad. Unless you’ve got resources to spare, why outfit them in anything other than the gear they were already wearing? Take belts, shoes and such, leave the rest. That’s what bothers me about this pic (and presumably the whole video, which I haven’t and won’t watch): How does THIS group have these kinds of resources? Perhaps it can be rationally explained, but this is bothering me. Apparently I’m the only one so bothered, though. Well, obviously the whole event was a staged photo op, intended to humiliate the poor victims while bolstering the image of the perpetrators. That is one of the meanings behind beheading them, after all. Or, dare I say, authors. I continue to be amazed that people in those professional classes think we can just magically burden commerce with all kinds of rules and regulations to avoid icky things, perceived slights, impossible result leveling, uneconomic investments etc etc without consequences. I agree with Dave that these were unintended consequences, but posed awhile ago the same question ice does: when things are so obviously gone wrong when does ideological rigidity become malice? It’s a staged production and they are playing the part. The uniforms look like they are Libyan military, but I’d have to do some research to confirm that. Not that hard to get and ISIS in Libya does hold a nontrivial amount of territory.